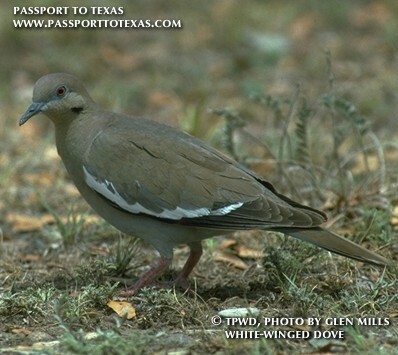 Geographical Range:Native to Texas but has been found in Southern California, Arizona, and Southern Florida, as well. Habitat: Leafy trees, mesquite trees, citrus trees, and desert scrub. Diet in the Wild:Seeds and fruit from cactus. Conservation Status:Not protected; this is a gaming species. Have been known to nest as a pair or within a colony. These birds migrate to Central America for the winter season. Within four days of birth the bird can eat seeds along with the milk provided by its parents. This bird can also eat the fruit from cacti. 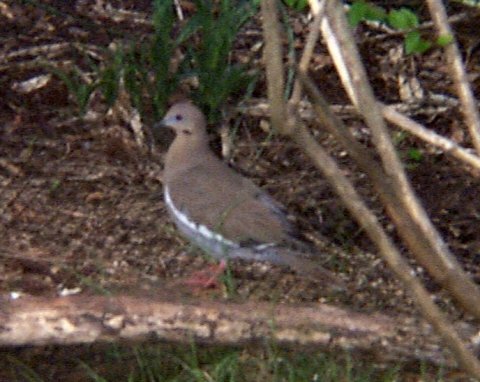 Since this creature can also build a nest practically anywhere it is able to construct a home in many different locations, whether it be in a tree at a park, a shrub in the desert, or in a neighborhood with a mostly warm climate. 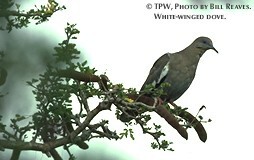 Since this animal has such a predominant presence in the state of Texas the White-winged Dove can be found in the Texas Wild section of the Fort Worth Zoo.